The English version of Annelie Feder’s book “Eurasiers Yesterday and Today” is now available. The book can be ordered direct from Annelie Feder. Place your order at annelie.feder@web.de. The book costs 37.50 Euros; shipping and handling to all foreign countries will add another 7.00 Euros. (The price of the English version is higher than the German original as the first edition of the English version had a smaller print run than the German one). His origen and his history. 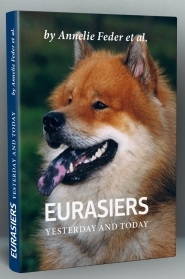 Who is interested in learning more about the original breed of the Eurasier, this book is to be recommended for study. 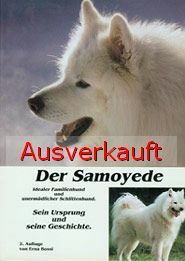 The Samoyede is an ideal family dog and enduring sled dog. 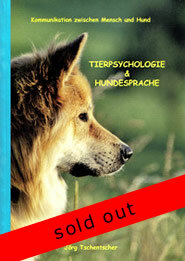 This quite new booklet shall help you, to better understand your Eurasier. When ordering the book, please state, whether you wish an autograph or not. Please click on the book. 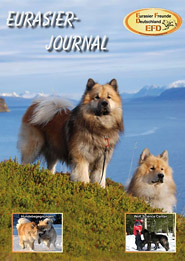 A total view of our excisting Eurasier Journals with contents you will find in the EFD-shop. Interesting non-members can receive the journal by the e-mail mentioned below. For EFD members it is free of charge.